I have been obsessed with making felt yarns. They were popular at the Fremont Market on Sunday as well. 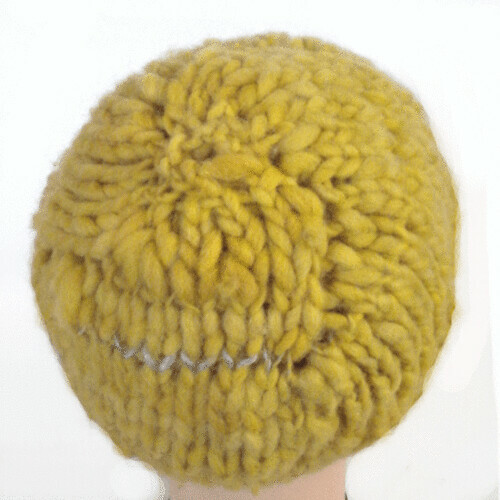 I made a hat out of one of the skeins (there will be a pattern soon for it), a felted wool with soy silk stripes. 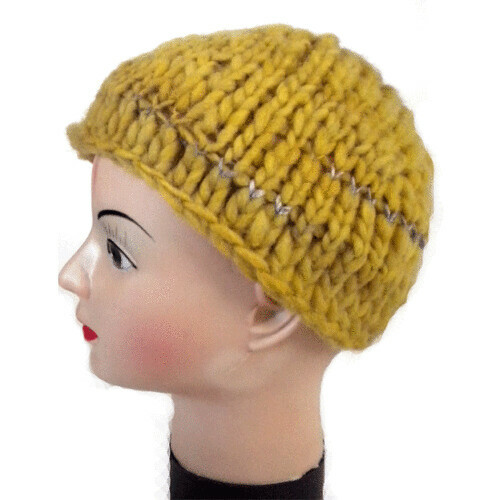 It is the same style yarn as the yellow and purple one (which makes cool stripes when knit up). The single ply felt is hard to make smooth, I have to felt the fiber a tiny bit before I spin it to avoid getting felted in "kinks" in the yarn, which would add more texture than I want in a yarn this thick! I join ends together really super carefully to make sure it sticks together- too felted and this yarn wouldn't work! Felt yarn takes a LOT of time to make. 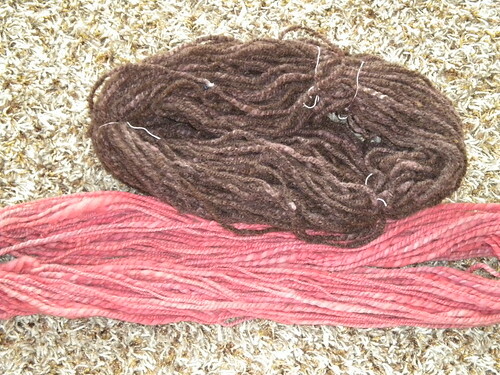 The skein on the bottom is a normal skein, the top is felted prior to being rewound. You can see how much yardage gets lost! Depending on the yarn, I lose 1/3 to 1/2 the yardage when I felt the yarn. 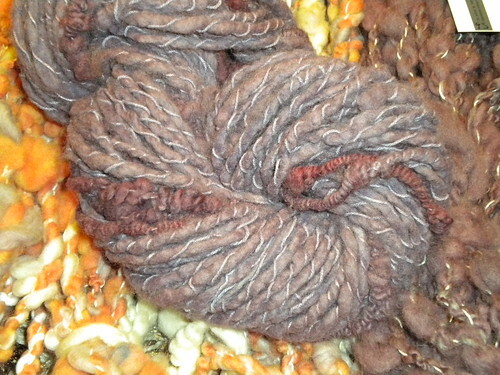 For this brown yarn and the purple and brown yarn I used local Pacific NW wool, spun and plied it in 2 ply, and felted. It should go without saying that I use cotton ties to hold the skeins together not wool! 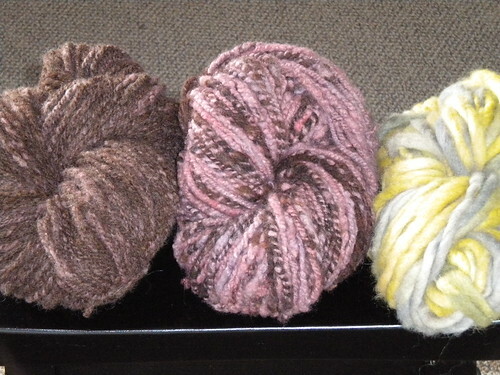 The resulting yarns are dense, fuzzy, but surprisingly squishy yarns. I expect the 2 ply ones to wear like iron, similar to a fulled fabric. 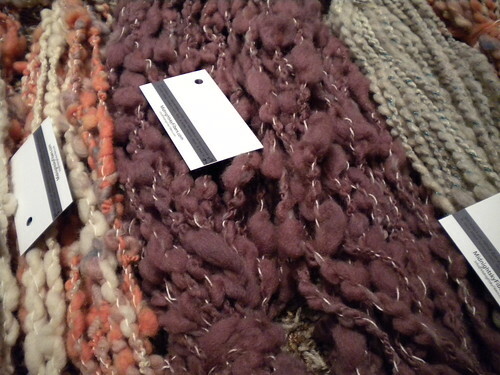 They get a bit of a boucle texture to them since they shrink more lengthwise than they do in width (ie the wraps per inch does not change overly much). 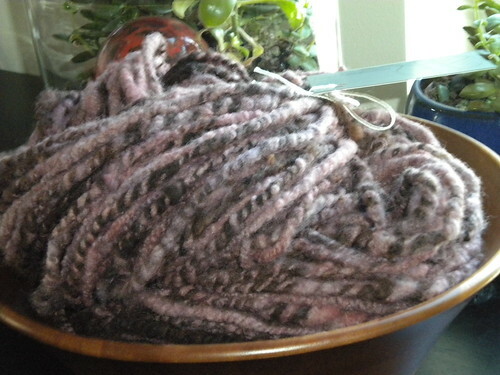 Felting also makes for an interesting yarn when the yarn has coils spun through part of it. The coils stay and don't felt much, but the rest of the wool yarn shrinks a fair bit. The straight uncoiled sections looked puffy and plied like the white yarn on the right here. Kristine, do you mean felt like the sheets of felt? you would make it the same way you would make a felt scarf, with layering wool and wet or needle felting.